Last week we talked about beating perfectionism and getting one thing done a day. How are you going with that? In that post, I mentioned the Pomodoro Technique as a useful tool to help you and today I’ll fill you in on what it is and how you can use it. It was invented in the late 80’s by Franceso Cirillo, although people have likely been using a system like this for centuries. Decide on one task you will work on. Work on your chosen task (and only your chosen task) until the timer goes off. If you are interrupted, deal with it quickly and get back on task. 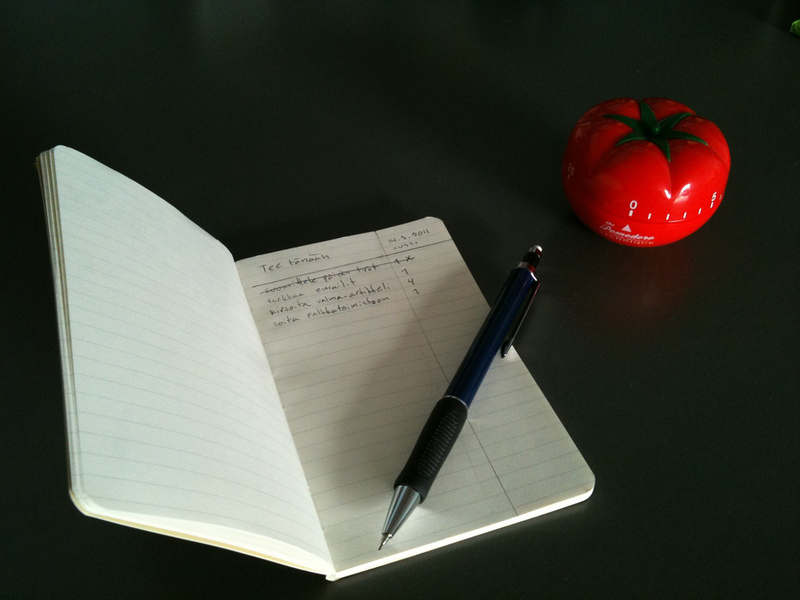 When the timer goes off, record your pomodoro (a check mark on a post-it note is fine) and take a quick 5 minute break. Do the process all over again. Once you have done 3 or 4 pomodoros, take a longer break of 20 – 30 minutes. It also helps me manage my energy better by forcing me to take small, regular breaks. When I am focused I can tend to push myself past the point where I should stop and give myself a break. Anyone one else guilty? And it’s great for dealing with interruptions. If my husband comes into my home office, all I need to say is “I’m on a Pomodoro” and he knows I will check in with him once I’m done. It’s kind of working with the kids too! I make sure I get out of my seat and away from the screen on breaks. Short housework tasks, getting a tea and snack, checking the snail mail, having a short wander in the garden are all good break activities. Sometimes I set the timer for a shorter time period if I know the task won’t take 25 minutes. Why is it called Pomodoro Technique? 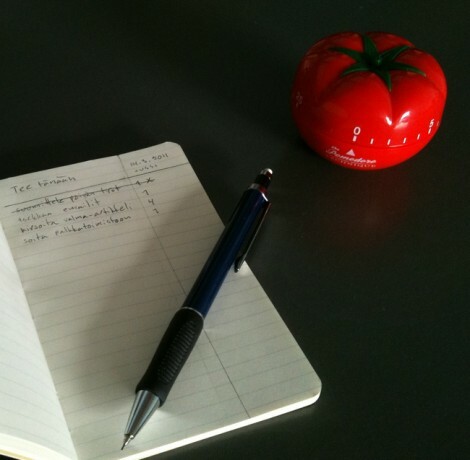 Try out the Pomodoro Technique this week. Do a session of 3 – 4 pomodoros. Stick to the rules and see how it works for you. Let me know how it goes in the comments. This is a really simple technique, and you don’t need anything to implement it, but there are all sorts of resources out there you can use if you want. Apps: If you search ‘pomodoro technique’ in your relevant app market, you will find apps you can use, lots of them for free. Pick one and try it out, but try to keep it simple. I like Pomodroido for Android. There is an extension for the Chrome Browser called Stay Focusd which is very useful. It also allows you to block distracting websites. Do you use or have you tried the Pomodoro Technique? What are your best tips to make it work for you? We’d also love to hear about your favourite apps or tools. Share with us all in the comments. Great tip! I’ve been doing something similar for the past 2-3 years now. Basically, I keep a text file where I have all my tasks for the day/week and I move them to the “Done” section when done. Each group of tasks have a date, so I can go back & see what I have done in the past month/year. I’m a software developer, so I use this text file to keep track of bugs/issues and how I fixed them, so that later I can refer back to this document whenever I encounter a similar situation. This keeps me focused and gives me a pretty good idea of how far I’m left to go to meet a certain milestone. This made a HUGE difference in my productivity. A timer is not necessary tho — most programming tasks can’t be broken down to 20 minutes chunks, often taking several hours to several days. I like this way of keeping track of what you’ve done Nick. It’s very motivating to look back and see how far you’ve come when progress feels slow. I did something similar in the past. At the end of everyday, I wrote down what I had done. It was great to show me that on some days, when I felt like I hadn’t done much, I had actually achieved more than I thought. I am with you Jen. I can definitely get lost in long projects. I probably should add that a task can take multiple pomodoros and that’s fine. Some of our teammates at Medialoot use the Pomodoro technique, and I think it’s something that I’d benefit from as well. Being the community manager, I can get lost in the social media procrastination cycle as well, and although it’s my job to read and share things, having more focus would be awesome! I’ve heard of similar techniques before never used it. I think this one will work well for me. Especially when I have to complete a task that I’m dreading. Thanks for tip – I’ll let you know how I get on. Bookmarked! Wanted to share another app to help with this. My company created http://www.marinaratimer.com for internal use, so we could adjust the lengths of time and share the timer with others on the same team/project. We recently made it public, so feel free to give it a try.